The Vogue first appeared at the Earls Court Show in 1962. The Veloce design of the Vogue was based on the 192 c.c. L.E. side valve engine aimed at the buyer who wanted L.E. silence with more style but without much dash. Sadly there was no such market and not very many were sold, buyers opting for the cheaper alternatives that were now on the market. The body was constructed from fibreglass hung on a new main frame structure composed of a large backbone from the head stock to a cross tube above the rear fork pivots. From this basic frame a second sub-structure was formed to carry the fibreglass panels. These were fixed by eleven bolts. A 2.5-gallon petrol tank was formed integral with the bodywork. At the front end twin side by side headlights were provided. The top surface behind them was formed to carry a windscreen and an instrument panel. Recesses were moulded in to the top panel for the radiator filler, battery, pump and toolkit. The legshields and footboards were moulded as one. The lower side panels were removable to gain access to the engine etc. A dual seat was supplied and bolted to the top moulding. The instruments consisted of a speedometer with a trip recorder, ammeter, ignition switch, lights switch, and indicator switch. These indicators were moulded into the panel work. The engine was the same unit as installed in the Mk.III. with a few very minor modifications. The oil filler was moved to the top of the crankcase. The gear lever was arranged to protrude from a curved slot within the side panel. The Miller generator was uprated to give 80-watt output to counter the heavy demand from the twin headlights, indicators and ignition. The rear suspension was fixed and tended to give a hard ride unless a passenger was carried. Performance was not good, and when tested in 1964, 60 mph was just achievable but dropped to 40 mph on small gradients. 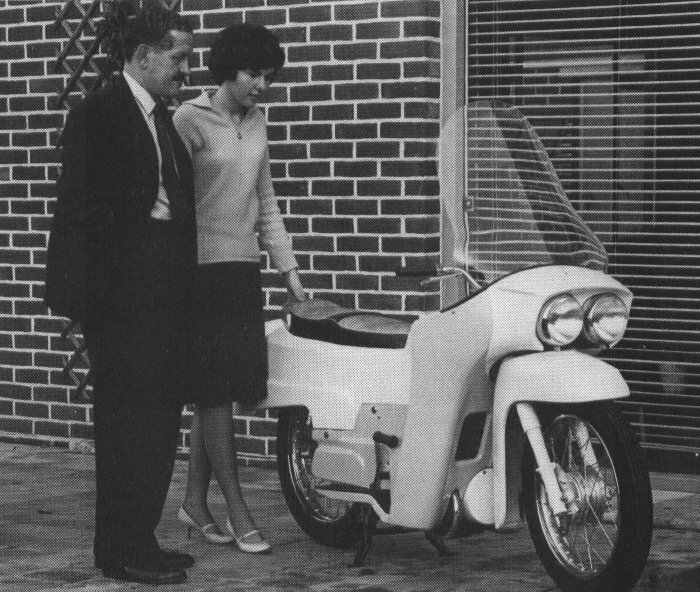 The Vogue was expensive at £246, and up to £272 if a windscreen, indicators and panniers were fitted. The Ariel Leader, its rival, sold for £225 and gave a better performance.